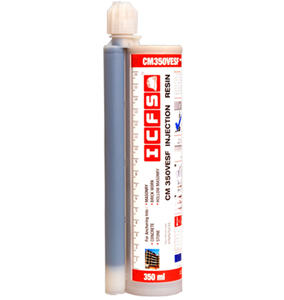 The CM350VESF is a high performance rapid curing styrene free low odor two component chemical. Chemical injection anchoring system based on a high reactivity unsaturated vinylester resin in methacrylate monomers. 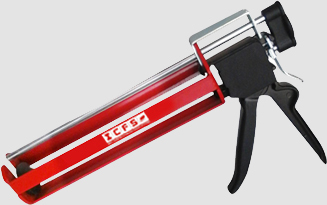 The side-by-side cartridge format comprises of a resin and hardening agent in separate internal compartments which are mixed to the correct proportions in the delivery nozzle when triggered using the required manual dispenser. Base Material Recommended for use in reinforced and non-reinforced concrete, rock and stone. It also provides a higher grade bond than standard epoxy acrylate resin in solid masonry, hollow brick-work and pre-cast (requires suitable sleeve) with minimal shrinkage. • Non hazardous environmentally friendly low odor. • Extreme heat and high chemical resistance. • High load values in concrete and masonry for medium to heavy duty applications. • Imparts no expansion stresses on the base material. • Suitable for close to edge and reduced anchor center fixing. • Usable in damp and wet environment and submerged drill holes.